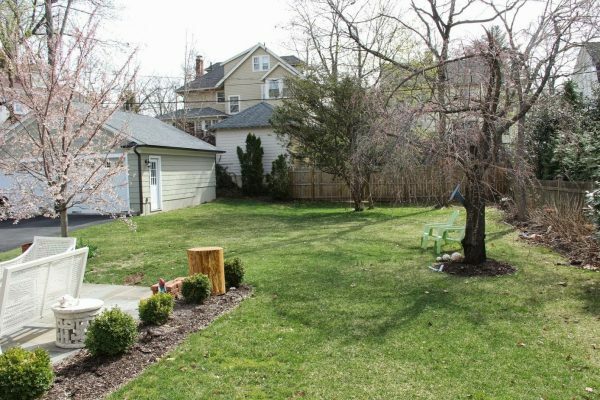 Confession Time – My BackYard is Ugly (and the Plan to Make it Gorgeous)! When I share photos of my back yard including my eclectic patio, my mop bucket planters, and my dresser planter, I’m hiding a deep, dark, shameful secret. Out of view and thanks to some strategically arranged camera angles, lies this horror. Mind you, these pics were taken right before spring last year so nothing is blooming and it’s pretty barren. These tiny boxwoods just aren’t cutting it. Air conditioners on full display. There’s a light at the end of my ugly backyard tunnel thanks to my fabulously talented friend Loi Thai who created this plan to help my yard go from sad to fab. 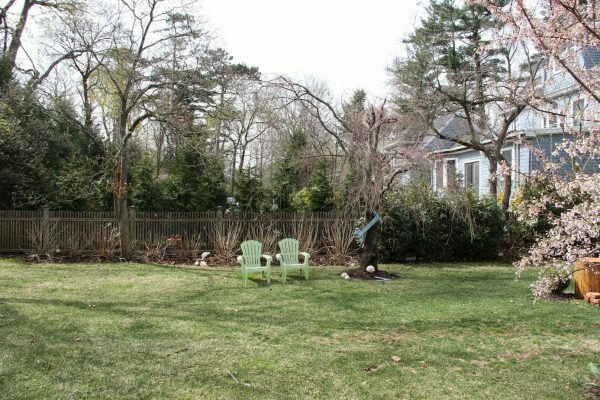 I love it – the layers of plantings that will give me much need privacy and interest. This is actually a pic of Loi’s own garden (which is amazing) and as you can see from the drawing, it shows how the hedge of holly will look with a bench as a focal point. 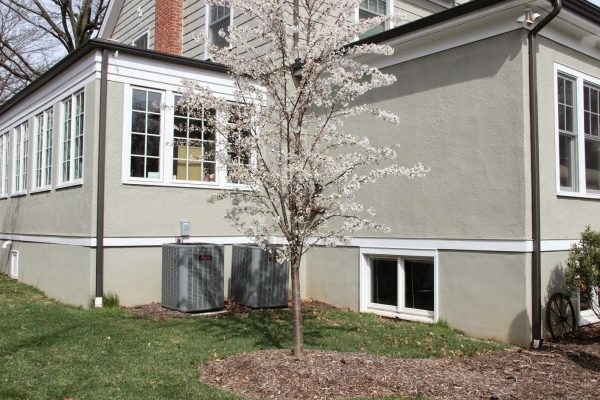 Make sure see Loi’s post filled with more details and tons of inspiration photos to get a better idea of what the finished yard will look like. I can’t wait to sit on my vintage glider with an ice cold margarita while gazing at my gorgeous garden (fingers crossed)! What’s your favorite thing about your back yard? i would hardly call your current backyard ugly but looking forward to seeing what you are going to do. Ok maybe not ugly, I should have said it’s hideous! How exciting — and fun to think about! It is – after 5 years living in this house, I can’t wait to have my yard ship shape Heidi! Just an fyi: your “statement lighting” link appears to be broken. Thanks for letting me know Riley – all fixed! We used to have a beautiful backyard – green grass, lots of flowering plants and then I got my two puppies who proceeded to eat everything they could. What they didn’t eat, they trampled. Oh dear. I guess that makes them my favorite thing. Ha. Now that they are two, maybe we can replant. I have a puppy and so far, she’s been a good girl! Fingers crossed she stays that way! loi is SO talented when it comes to gardening, and pretty much most things, i think. can’t wait to see his plan come to life! I don’t think your yard is horrible. I can’t wait to see the changes. Give the boxwood time. They fill in beautifully. Holly is a great choice. When I look out my kitchen window, which I am forced to do every time I do dishes, I see my pergola, covered in wisteria. In the summer, it’s beautiful, but in the winter it looks like a giant birds nest. The birds see it that way too and collect in it during blizzards. We hang lots of bird feeders there and some birdhouses, but even that doesn’t take away the ‘brown, dead branch’ effect. Just beyond that however, are my lovely holly bushes, always green (and providing plenty of branches for Christmas decor). They are so low maintenance, we never do a thing to them, no watering, fertilizing – nothing. They were little bitty things when we planted them, not more than 12 inches high and now they are easily 12 feet high. I will confess, it is my dream to plant a holly maze in my 2 acre backyard with a small ice skating pond in the middle, complete with a fire pit and benches – I can dream can’t I? I love holly too – had it in my first house. At least you get to see and smell the beautiful wisteria most of the year. Can’t wait for spring so I can get planting! Oh, and every year, my neighbors makes an ice rink in their backyard – it’s so fun! 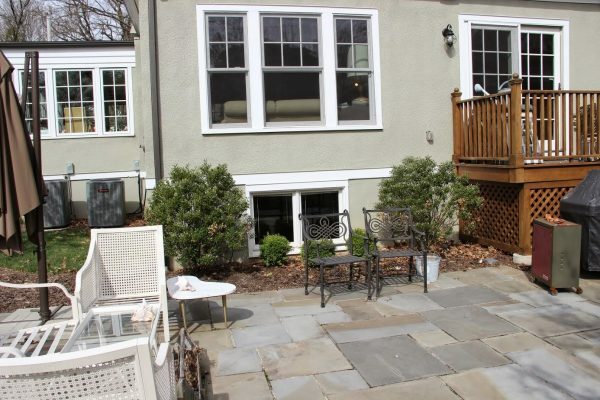 well, I love your deck and I would love to have a stone patio like yours. It’s really pretty. I don’t think it’s quite as bad as you say but I understand where you are coming from. 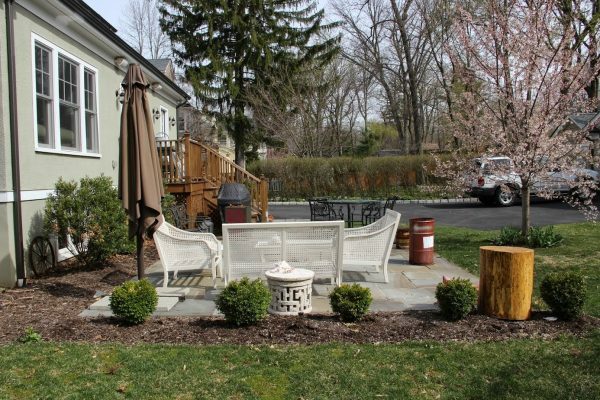 You’re looking for that backyard retreat and what you have planned is going to take your nice yard to a gorgeous yard. I unfortunately have the same problem as some of your other followers, she’s a 70lb Akita shepherd and she eats or digs up everything we try to do, literally. We love her so it’s a trade off right now. Good luck with your project and I hope you share lots of pictures! Luckily, my little Sushi hasn’t ransacked my yard … yet! We don’t have a full fence so we always take her out on a leash – but I’m sure if we left her out there, she’d dig up everything in her path too! WoW Kelly–it’s going to be beaUtiful! 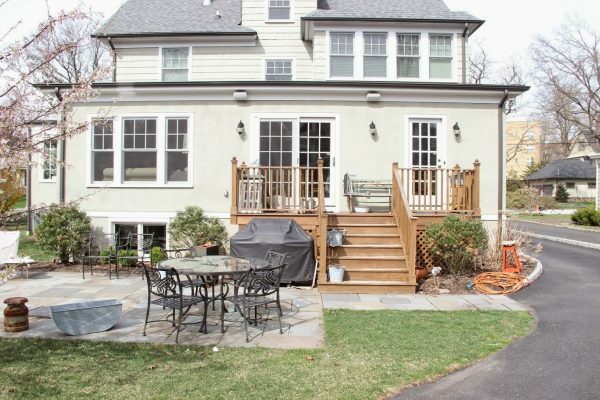 When I came back to my mother’s house to build an addition to the face and renovate everything else, putting some focus on the yard/garden couldn’t be ignored. We worked with a landscape architect too to expand my grand ideas. The outcome to EVERYthing is beautiful and so very worth it! Can’t wait to see yours as it takes shape! Thanks so much Catherine! You’re smart not to ignore the yard – it always seems to be left for last! My yard is a work in progress. I have planted flowers in beds along the perimeter. The problem is I have septic laterals that run through the back yard and I cannot plant anything over them so I have a 150’x75′ grass area. No trees:-( Now if I could just get the Japanese Beetles to quit eating my roses life would be good. I hate Japanese Beetles – wonder if they still sell that beetle bag I remember my parents used when I was a kid? It trapped all of those bad boys! I saw this yesterday on Loi’s website and I loved it. My only question is would it survive in Connecticut? I would love to do this in my yard. I am in NJ and I think it would work for you too. I’ve had holly at another house and my hydrangeas do really well here. Ask your garden center to make sure – good luck! Great advice to ask the local nursery!!! I will Loi – can’t wait for spring so I can get planting! Does anybody’s yard look pretty after winter gets thru with it? I can see way over to a neighbors yard when our trees are bare, like it much better with leaves on trees to block view. We’re up above some of neighbors yards on small hill, it’s nice in some instances but not necessarily others. 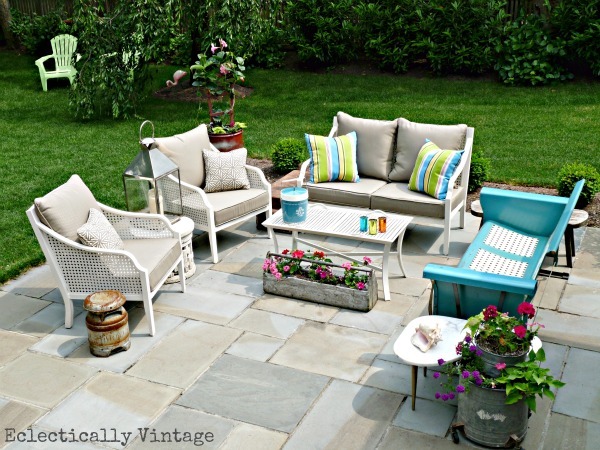 From the photos your yard is pretty darned nice, how do you keep it so nice? 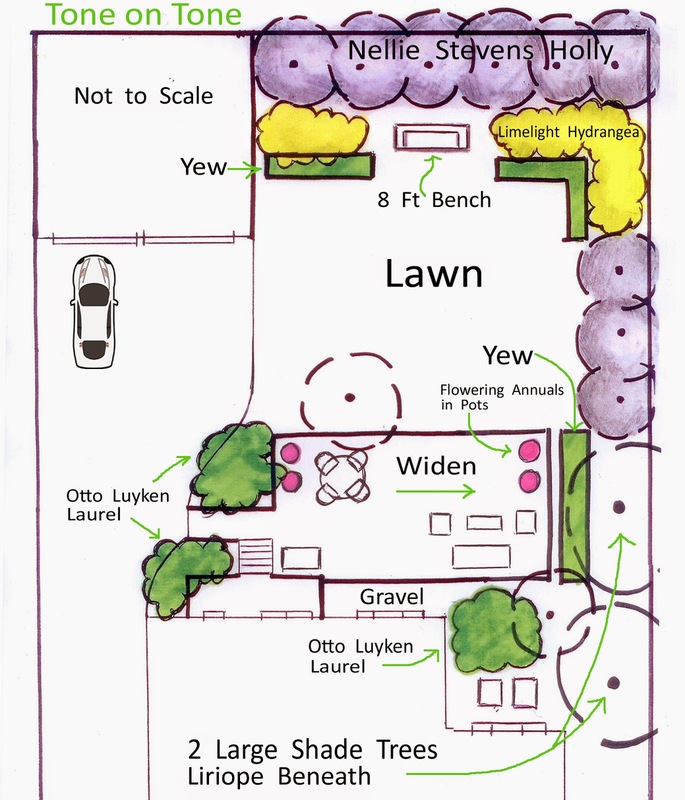 Your landscaping plan looks pretty, will look forward to seeing the results. 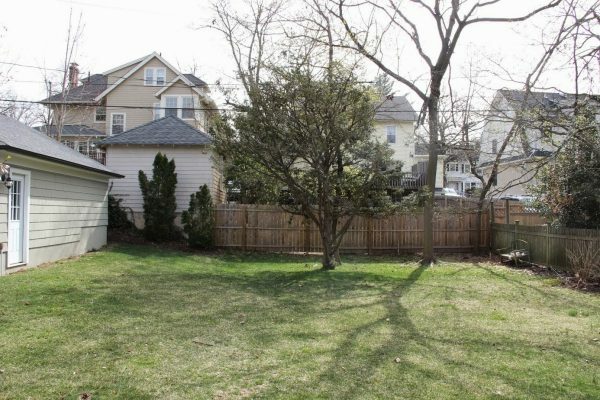 You have nice sized yard also. Enjoy it when it’s done. 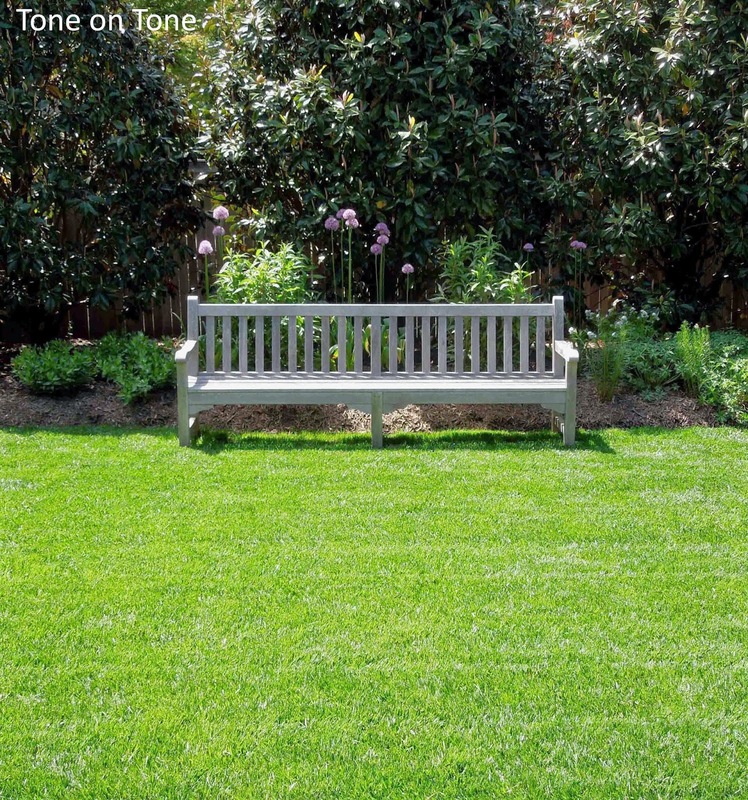 Thanks JaneEllen – my hubby is a lawn fanatic and makes sure the grass always looks lush. I have very close neighbors all around – the people behind me have a deck that overlooks my yard – so very tall holly bushes are definitely on my list! My back yard is a wip but hope to do more this spring.I don’t think you ever are truly finished with anything you live in for very long and i have been here 15 years. I can’t wait to see the changes you make to your yard even though it is pretty already. True – these things evolve over time. Been in this house 5 years and been wanting to work on the yard every spring – hopefully this is my year! Looks wonderful Kelly! How amazing to have such a talented friend! Can’t wait to see the transformation! Thanks Taylor – and yes, thanks to Loi, I know my yard will look amazing! You are so lucky to have Loi on board with this one! He is just amazing and a real nice person!!!! Can’t wait to see you get started!